Calling upon the spirit of the famed Sibyl of the Salons, Mlle. 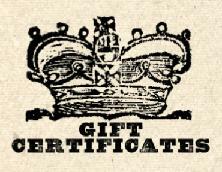 Lenormand Oil is a liquid communion with the most famous card reader in history. 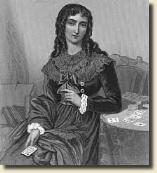 Marie Ann Lenormand was given her first deck, by her own account, by gypsies at age 14 and through hard work and her gift of Sight became famous for her predictions, including her pronouncenments for Empress Josephine. While the famous deck with her name, le Petit Lenormand, was a posthumous German homage, the very use of the moniker added legitimacy and glamour to any number of decks bearing her name. 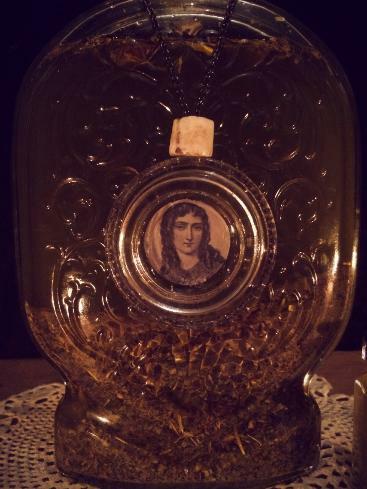 Through the properly purchased and much honored graveyard dirt of the Mlle., this oil provides a potent means of communicating with her spirit. Enhancing the Sight and comprehension of those who would use it, the oleum is charged and constructed according to the explicit instructions from spirit of the Prophetess herself. 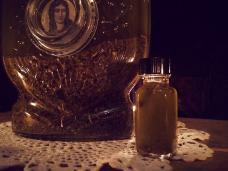 An immediacy of spirit is present in the oil, owing much to the relics and herbal agents quickening its grace. 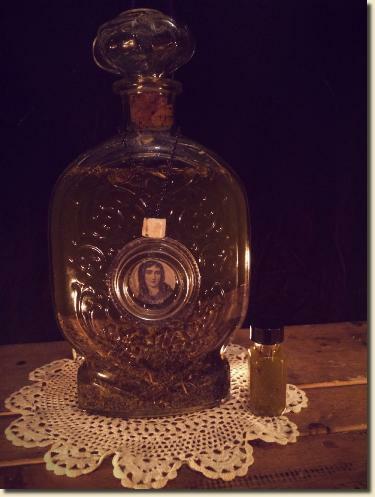 As a parlor oil, it may be used in one's divinatorium to increase contact with one's advisory spirits, intuition, and the Mlle. herself. Here she comes both as she was, and what we have made of her - for such is the way of spirits! While it may be used to aide the cartomancer and diviner outright through the intercession of Mlle. Lenormand, the oleum can also help raise someone above their station through diligence, bring fame (or notoriety), and increase public exposure of personal accomplishments. Price is for one half ounce bottle of Mlle. Lenormand Oil. 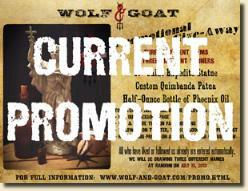 If you are interested in greater amounts, please contact us. Closeup of the mother bottle of Mlle. Lenormand Oil.